If you’re not keen to use disposable nappies on your baby and aren’t brave enough to try elimination communication (the no nappy approach), then cloth nappies are the answer. Here’s our beginner’s guide for all those parents looking to use reusable nappies. There are so many benefits of using reusable nappies over disposable ones, so it’s no surprise that many mums are keen to go down this path when expecting or preparing to have a baby. A baby will go through around 6,000 disposable nappies in the first two years compared to roughly 15 reusable nappies, meaning a cost saving of several thousands for just one child. And if you have additional children you can save even more if you reuse the same cloth nappies too. It’s sickening to think about the amount of disposable nappies and plastic nappy bags sitting in landfill, contributing to the gas emissions thanks to the trapped soiled waste. By using reusable nappies and disposing of waste properly, you’re freeing up space in your bin and doing the environment a massive favour. When you do eventually throw away your cloth nappies, they break down much more easily. Washing cloth nappies does us a lot of water and energy, especially when using warm or hot temperatures. If you’re looking to minimise your impact on the environment even further, then use eco-friendly front loaders on cold cycles. Embracing cloth nappies means you’ll always be washing and reusing your baby’s nappies and never run out – that is, unless you fall behind on the washing. But, most of the time you’ll be prepared with a freshly washed stack and no need to make a last minute dash to the shops to restock. Cloth nappies have come a long way since our grandparents’ days. The majority of cloth nappies are now extremely soft and arguably more comfortable than those tight disposables. There are also so many different brands on the market now, which means you can buy reusable nappies in a bunch of super cute prints too. On the flip side, cloth nappies can also be a lot more inconvenient for tired, busy parents and there are a few things to consider before you make the commitment. New bubs basically poo all the time and require an average of 10 nappy changes a day! That’s a lot of poo to wash out of those cloth nappies and does mean you’ll be spending more time in the laundry than anyone really wants to. This is on top of all the extra baby clothes and linen you’re already washing. You can’t just throw all the soiled nappies in the washing machine, you need to remove the poo first. This usually means you need to have a system in place, such as a sealed bin for storing prior to washing. Flats and pre-folds: These are the traditional cloth nappies that you fold and pin, and pre-folds are similar but have extra padding. Fitted nappies: Similar in shape to disposable nappies with cloth tabs for closing. 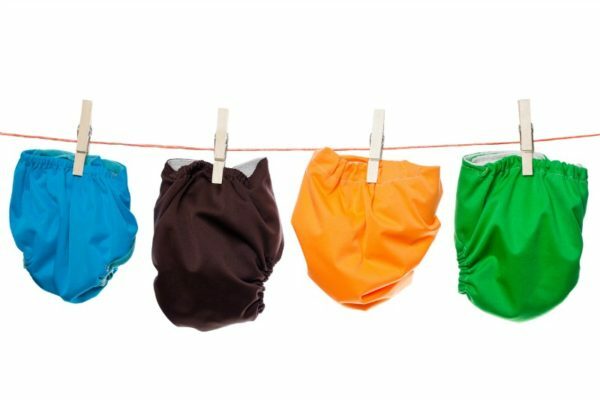 Cloth nappies also come in a range of different fabrics, such as bamboo, cotton, hemp and microfibre – each varying in comfort, durability and drying time. It’s a good idea to get a range of different types to get a feel for what works best for you and your bub. Fitted nappies have the additional benefit of being as easy to put on as disposable nappies, and there are plenty of fun prints available. Buy at least 15-20 reusable nappies: This will be enough to ensure you’re not washing 10 times a day. Get a system going: You can set up a pressure water hose near the toilet to spray the waste straight from the nappy into the toilet before flushing. Nappies can then be placed in a nappy bin with a sealed lid (if most waste has been removed) until washed. Dry in the sun: You have a much better chance of removing poo stains with natural bleaching from sunlight. Wash regularly: Don’t leave soiled nappies for longer than two days or they’ll be much harder to clean and lesson the elasticity and durability of certain nappies. Use warm water: Wash cloth nappies at 60 degrees, any hotter and you could compromise the quality of your nappy and any colder will make it harder to lift stains. Use biodegradable liners: This is an easy way to remove poo so you have a much cleaner nappy to wash, possibly eliminating the need for scraping waste, bad smells, bucket soaking and scrubbing stubborn stains. Use stain remover: For those really persistent stains. Don’t give up: It might be challenging to begin with but once your systems are in place, you’ll love the benefits cloth nappies bring to your life. Consider other options: You can use cloth nappies part-time or wait until your bub is a few months older and pooing less frequently. Even just swapping one disposable nappy for a reusable one a day will make a difference to your pocket and the environment. Would you consider using reusable nappies? Or have you got your own tips to share?